to this page. Contact Sharon or Elaine. 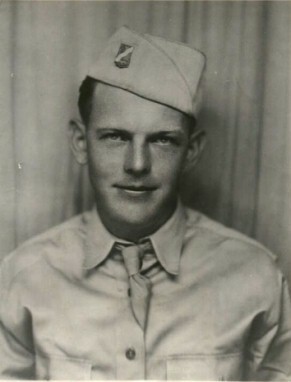 Leming Dale Moore, a former resident of Kilgore, TX served in the US Army in WW II with the 143rd and 144th infantry regiment of the 36th Division. He entered the Army at Brownwood, TX, at Camp Bowie, on Feb. 3, 1941 and served until July 4, 1945, when he received an Honorable Discharge at Fort Sam Houston, TX. Leming, when in the 36th Division, saw service in North Africa, Italy and France. Battles and Campaigns he was in included Rome-Arne, Southern France, Rhineland, Central Europe and Naples-Foggia. Decorations and Citations he received were: Rome Campaign Medal with 3 Bronze Stars, Good Conduct Metal, American Defense Service Medal, Purple Heart. Leming was wounded by night time shelling on Oct 12, 1944 at Laveline, France. He had surgery for his injury and recuperated at Naples, Italy. 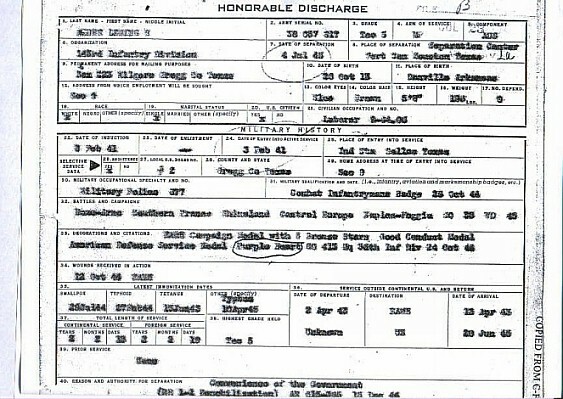 On Dec. 4, 1944 he was returned to full duty. His unit saw plenty of action, fighting some of the most difficult battles of the war. They pursued the Germans to Germany and Australia as the War ended. I knew Leming Moore as my father's 1/2 brother, my Uncle L.D. or "Mook." He was born when my Dad was 11 years old. My Dad's Father had died when he was age 3 and his Mother married again having 4 children and the Step Father died when my Dad was 13 and his youngest brother Leming was just 2 1/2 years old. They were born and raised on a small farm in Moss Creek, Yell CO, AR and came to East Texas and the Kilgore area during the oil boom of the 1930s. Several of the family worked for the Sun Oil Company and took great pride in the Company and their work. Leming Dale Moore was born on Oct. 28, 1913 at Danville, Yell CO, AR to Mary Dine Wilson (Mrs. James William Moore or Moores). Leming Moore died in Arlington, Tarrant, CO, TX on April 25, 1980. I regret that I did not know of my Uncle's War service and injury while he was alive so that I could have properly THANKED him for helping to make and keep our county free. It is to Honor his Memory and his Service that I submit this information for a WW II web page on the Gregg, CO, TX webpage.